As we greet another new year, we bid 2014 farewell and are excited about new opportunities in 2015. The wine country real estate market continues to flourish with a limited quantity of quality inventory and ongoing demand. We’ve been fortunate with an abundance of rain to start the rainy season and our community showed its resilience by coming together after the Napa earthquake last summer. While last year was full of challenges, we were able to overcome the hurdles and move forward. The wine business remains strong with another great harvest. All signs point toward another positive year. 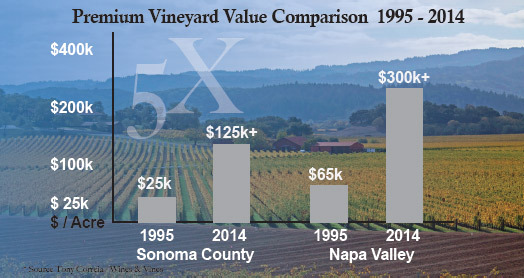 Speaking of the new year and exciting opportunities, I would ask you to take a look at my new web site, www.vintroux.com or www.vineyardandwinerysales.com where you can find this article and more wine country real estate information. In this edition we will touch on vineyard sales, an overseas buyer update, the 2014 crop, the drought and ways to conserve water, the winery market and permit challenges, a spot check (RRV), 1031 Exchange quick reference, and a few other interesting tid bits. Let’s get started! We’ve come a long way since 2009 when it was almost impossible to give vineyards away. Slowly various industry players and lifestyle buyers started to make their move picking up vineyards, vineyard estates and wineries. Over the last several years many properties have traded driving prices to new highs. Even so, demand remains heated especially for areas known for producing the highest quality varietals like Pinot Noir in the Russian River and Sonoma Coast Appellations in Sonoma County, and Cabernet Sauvignon from any of the top tier regions throughout Napa County. That said, Cabernet Sauvignon remains a hot item throughout the North Coast. Other regions and varietals still remain attractive in top areas throughout Sonoma and Napa counties. Real World Numbers – Still a bargain! Burgundy and Bordeaux. For more than 15 years prices have maintained steady annual price increases. Gran Cru in Burgundy: Recently vineyards at the Gran Cru level sold for anywhere from $1,350,000 / acre up to $6,500,000 / acre at the extreme high end. With that in mind, our own “Gran Cru” vineyards like To Kalon in the Napa Valley would still be considered a bargain… if it were for sale. When speaking with sellers the conversation inevitably turns to the potential for an overseas buyer, many times focusing on “all the money coming out of China.” There is some truth in the allure of all cash foreign buyers, but it varies by degrees. If we were to call San Francisco the epicenter of overseas buyer activity, then the sphere of activity fades quickly as you move away from the city and Peninsula. In wine country, Napa County would be considered the epicenter of overseas buyers (a much lower percentage than San Francisco). Once again, the sphere of activity quickly fades as you venture into lesser known areas. Even so, I’ve had European and Asian clients active in both Sonoma and Napa Counties this past year. 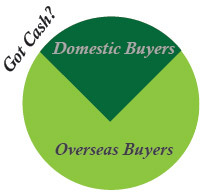 even though an all-cash Foreign Buyer is a possibility, the vast majority of buyers are domestic. While this sounds like another credit card offer, it is actually a vehicle for wealthy overseas investors to gain a visa or permanent green card. By investing $500k – $1,000,000 in a U.S. business that either creates or preserves 10 jobs, the overseas investor can obtain a visa or green card. This program has been around for nearly a quarter of a century and according to the Los Angeles Times, 2014 was the first year where allotment (10,677) was tapped out. For the last five years, the number of applicants has almost doubled each year with more than ¾ of the EB – 5 funds coming from China. One of the earliest starts to harvest on record in Sonoma County began at the end of July and helped ensure that the crop came in before winter rains arrived. All things considered, including the drought and earthquake, the 2014 growing season was about as nice as it gets. Grape growers were presented with barely any frost and mild temperatures throughout the growing season. The 2014 crop came in early and came in strong, the third consecutive quality harvest in a row. Even though the 2014 harvest was less than the year before, it was solid and a bit surprising considering the drought conditions and consecutive large harvests before. A typical pattern would be a large harvest followed by a smaller harvest. Now that newer plantings are starting to produce and will continue to come on line, we are expecting that the 4 million ton crop is the new normal for California wine grape production. Fortunately for us, wine demand continues to grow and according to Western Farm Press, California makes up 10% of the world wide wine market. Within the United States alone, consumers purchased 375 million cases of California wine. The trend continues to be positive as wine consumption in the US has increased for the 20th consecutive year and we have even become the largest wine market in the world, ahead of France. One thing is for sure, it’s been a dry three years, one of the driest stretches on record. Until recently there wasn’t a day that went by when there wasn’t an alarming mention of the D word. Fortunately, we closed out 2014 with an abundance of rain. We remain cautiously optimistic for the rest of the rainy season as we claw our way out of the most serious drought in recent times. In a rare but encouraging sign, both agriculture and environmental interests have come to a compromise on protective buffer zones for streams and rivers in Sonoma County. The set back will range from 50 to 200 feet from the watercourse banks, including approximately 3,200 miles of streams and rivers in the area. The compromise will prohibit future farming and development in the buffer zone but will allow exemptions for wells and agricultural turnaround roads. In another sign that necessity is the mother of invention, two areas in Napa County are excited about alternate water sources for landscaping and vineyards. Both areas are known for producing excellent wine grapes and spotty groundwater production. The five mile long Coombsville project broke ground in August with assistance from a state grant. Back in July property owners in Carneros voted to approve a 9 mile long pipeline to provide recycled water to the area. These two projects will more than double the districts recycled water network and, as a result, we can all count on continued production of premium wine grapes from both regions for the foreseeable future. now that both real estate and balance sheets have vastly improved. Even so, both new and old players will continue to look for opportunities to get in the game. certain, this example has sent a shockwave through the community. It also points to the increased value of permits that allow for more production and more events versus permits that are limited. the greater RRV Appellation and produce high quality wines. 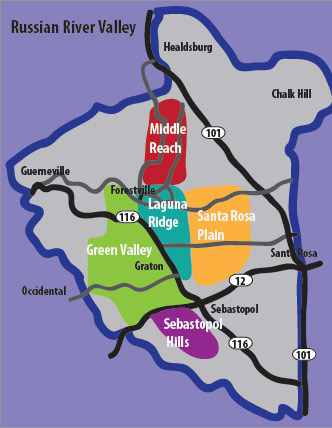 The styles have a dramatic range in line with the vast diversity of the Russian River Appellation itself. Both properties, selling and buying, must be held for investment, business, or income use. > Titles Must Match – the title of the old property and replacement property must be the same, otherwise the IRS will disallow the exchange. > Reinvestment of Sales Proceeds – you must purchase a property of equal or greater value and you must reinvest all cash proceeds from the sale. Consult with a Certified Public Accountant for any tax or financial advice / guidance prior to sale or purchase. I wish everyone nothing but the best in 2015 and look forward to hearing from you with any questions or feedback.